By Michael Diamond--I would estimate that I have sent out between ten and fifteen thousand emails. Over the past 10 years. Virtually all have been written in order to help to strengthen the Jewish People in one of a number of ways- to build awareness of important issues, to educate, to encourage action, or to support pro-Israel activities and initiatives, or weaken anti-Israel initiatives. This email has the same purpose but the topic is quite different. This email is about my beliefs about the value of UJA Federation of Greater Toronto to the Jewish Community of Toronto, as well as to Israel and the Jewish people as a whole. Why, after all these years, and all those emails, is this the first email that specifically focuses on UJA? Because, having now been on the Board of UJA for 3 years, and being the Chairperson of the Israel Engagement Committee of UJA, and after being on the Jewish Identity Committee, I have become familiar enough with the organization to better understand its value. And this year my brother Steve has taken on the considerable task of co-chairing the UJA Annual Campaign. Those major involvements have led the two of us into a number of conversations which have allowed me to analyze and share the reasons why our family has been such ardent financial supporters of UJA for our lifetime, and why we continue to do so. Yes, we give because we "always have". And because we "should". And because our parents taught us the value of Community. But when we broke it down analytically there was more, much more that was driving us to make UJA by far the largest piece of our annual philanthropic budget, which like many of you, includes a host of valid recipients. There are many of you reading this who would prefer to donate directly to specific organizations, Jewish or not, as opposed to putting the funds through UJA, and having some group of people make allocation decisions about your funds. I understand that....it sounds reasonable on the surface, but upon further analysis, it fails the test for three reasons. There are many organizations in our community that do good work and deserve our support. However, there is only ONE organization that works across the Jewish community in Toronto, that brings together in its committees and Board and among its professionals, representation from the entire gamut of the community: from secular to progressive to orthodox; from those who see their Judaism as primarily religious to those who see being Jewish as being part of a People and a Nation; from those who love Israel without question to those whose allegiance to Israel is often challenged by decisions with which they disagree on the part of the Israeli government; from those who believe we should be spending more on advocacy, to those who would have more money invested in Israel, or on the needy, or any number of other causes; from those who believe in Supplementary Education as a critical way to build Jewish Identity, to those who see Day School education as being paramount, and who may have little respect or regard for Supplementary Education. I could go on, but the primary message here is simply one of COMMUNITY..... without community, we are separate and apart, disparate and weak, fighting instead of working together, confused and disregarded. WITH Community we are able to dialogue more easily, compromise with understanding, work together to achieve common goals, come together when there are tragedies or a crisis to deal with, and lead as needed. Sure, some of you may have had one or more negative experiences with people in Federation who have irritated them or worse. Real or perceived slights. Missed commitments. Errors. Feeling ignored. The list goes on. To you I say....those people who irritated you are likely not involved any more, or if they are, one day they will not be. But the institution lives on, and is no less critical to your life and the lives of your children and grandchildren. What you should perhaps be asking yourself is this... does this organization operate with integrity, and with efficiency? Does it act in the best interests of the Jewish Community and the Jewish People? In that regard, because of my involvement, I can answer "yes" to those questions because I now have an inside look at UJA. I know the people and see how they interact. I better understand the complex interplay between the lay volunteers and the professionals. I know that the governance of a non-profit of the size of UJA Federation is highly complex, given the need to both satisfy the volunteers, as well as the donors of all sizes (particularly some of the major donors who, whether you like it or not, are not going to donate millions of dollars unless people pay attention to them!). I have watched as steps are taken to make the organization more efficient. And I have watched the struggle to maintain the flow of dollars so that there is enough to meet all of the very important and valid demands on UJA's dollars from the community in all areas, including education, Jewish Identity, assisting the needy and of course supporting Israel with dollars and advocacy. Indeed, where would we be if Federation did not exist to pull us together in times of crisis, whether local or in Israel or elsewhere in the Diaspora? And where will our children and grandchildren be if there is no Federation to be the focus of this community? There are imperfections as well as differences of opinion of course. But in dealing with those challenges, I am comfortable that the right values are in place and the right people are in positions to make appropriate decisions, whether I agree with them or not. And I am able to look past the imperfections because of the overriding value of what Federation brings to this community, and how much the community has benefited from Federation. There is also a practical value of having a community organization the size of Federation and that is the value of leverage. Size can be expensive if inefficient, but it can also be more effective than any small organization in many cases. Whether it be centralizing advocacy, or offering a singular view to government about our point of view around issues in the Middle East or in the support of social services, or when a major donor wishes to invest 9 figures in scholarships for Canadians and Israelis, Federation has the capacity to gather people, to centralize resources, to operate and to lead. No other Jewish organization can do that in the way that Federation can. With a cross community organization like Federation, we have a centre. Much as a home needs a centre around which the remainder of the home exists, a place where you feel safe and you can gather, so Federation is that Centre for Jews who live in the GTA. And let’s not forget about what our Toronto community brings to the broader community of the Jewish People through its leadership, its contribution to common causes, its support for various initiatives in Israel and elsewhere, and by the example it sets for other communities. We are lauded around the world for the strength of our community, for good reason. And that strength starts with Federation. We take UJA Federation for granted, but we should not. We cannot. Or we will all lose by it. So this is my suggestion...I believe that every Jew in Toronto should join the Federation "club" by donating whatever they can afford, whether they donate elsewhere or not. I say this to the philanthropic among you, as well as those who do not participate in that activity. I say it to the wonderful people who are so critical to many of the Jewish and secular charities they support. I say it confidently to every Jew in the GTA because it is logical and makes sense. And I say it because when you donate to Federation you support a host of initiatives- Israel, Jewish Identity, the needy and elderly, and education, among others. But in addition to supporting all of those initiatives, you get a second benefit from your dollars- you build the strength of Our Community as well. In effect, you get a "double hit", a double mitzvah, which you cannot get elsewhere. That, plus the leverage associated with donating to an organization of the size and effectiveness of Federation, makes donating to Federation entirely logical if you care about the Jewish people and our community. It is no accident that the Toronto Jewish Community is among the most vibrant, and safest, in the Diaspora. And given that the majority of our children and grandchildren are going to live here in the future, UJA Federation deserves our support for what it does today, and for what it must continue to accomplish in this incredible community of which we are all part. Michael Diamond is a UJA Federation Board Member and the Chair of its Israel Engagement Committee.It’s no accident that Jewish Toronto is among the most vibrant Diaspora communities By Michael Diamond--I would estimate that I have sent out between ten and fifteen thousand emails. over the past 10 years. Virtually all have been written in order to help to strengthen the Jewish People in one of a number of ways- to build awareness of important issues, to educate, to encourage action, or to support pro-Israel activities and initiatives, or weaken anti-Israel initiatives. This email has the same purpose but the topic is quite different. Those major involvements have led the two of us into a number of conversations which have allowed me to analyze and share the reasons why our family has been such ardent financial supporters of UJA for our lifetime, and why we continue to do so. Yes, we give because we "always have". And because we "should". And because our parents taught us the value of Community. But when we broke it down analytically there was more, much more that was driving us to make UJA by far the largest piece of our annual philanthropic budget, which like many of you, includes a host of valid recipients. Sure, some of you may have had one or more negative experiences with people in Federation who have irritated them or worse. Real or perceived slights. Missed commitments. Errors. Feeling ignored. The list goes on. To you I say....those people who irritated you are likely not involved any more, or if they are, one day they will not be. But the institution lives on, and is no less critical to your life and the lives of your children and grandchildren. What you should perhaps be asking yourself is this... does this organization operate with integrity, and with efficiency? Does it act in the best interests of the Jewish Community and the Jewish People? In that regard, because of my involvement, I can answer "yes" to those questions because I now have an inside look at UJA. I know the people and see how they interact. I better understand the complex interplay between the lay volunteers and the professionals. I know that the governance of a non-profit of the size of UJA Federation is highly complex, given the need to both satisfy the volunteers, as well as the donors of all sizes (particularly some of the major donors who, whether you like it or not, are not going to donate millions of dollars unless people pay attention to them!). I have watched as steps are taken to make the organization more efficient. And I have watched the struggle to maintain the flow of dollars so that there is enough to meet all of the very important and valid demands on UJA's dollars from the community in all areas, including education, Jewish Identity, assisting the needy and of course supporting Israel with dollars and advocacy. There is also a practical value of having a community organization the size of Federation and that is the value of leverage. Size can be expensive if inefficient, but it can also be more effective than any small organization in many cases. Whether it be centralizing advocacy, or offering a singular view to government about our point of view around issues in the Middle East or in the support of social services, or when a major donor wishes to invest 9 figures in scholarships for Canadians and Israelis, Federation has the capacity to gather people, to centralize resources, to operate and to lead. No other Jewish organization can do that in the way that Federation can. With a cross community organization like Federation, we have a centre. Much as a home needs a centre around which the remainder of the home exists, a place where you feel safe and you can gather, so Federation is that Centre for Jews who live in the GTA. And let’s not forget about what our Toronto community brings to the broader community of the Jewish People through its leadership, its contribution to common causes, its support for various initiatives in Israel and elsewhere, and by the example it sets for other communities. We are lauded around the world for the strength of our community, for good reason. And that strength starts with Federation. And I say it because when you donate to Federation you support a host of initiatives- Israel, Jewish Identity, the needy and elderly, and education, among others. But in addition to supporting all of those initiatives, you get a second benefit from your dollars- you build the strength of Our Community as well. In effect, you get a "double hit", a double mitzvah, which you cannot get elsewhere. That, plus the leverage associated with donating to an organization of the size and effectiveness of Federation, makes donating to Federation entirely logical if you care about the Jewish people and our community. It is no accident that the Toronto Jewish Community is among the most vibrant, and safest, in the Diaspora. And given that the majority of our children and grandchildren are going to live here in the future, UJA Federation deserves our support for what it does today, and for what it must continue to accomplish in this incredible community of which we are all part. 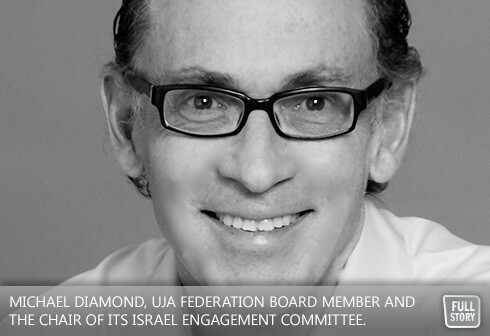 Michael Diamond is a UJA Federation Board Member and the Chair of its Israel Engagement Committee.